Scholarship funds are created by donors, including individuals, corporations, and organizations, to assist local students pursuing higher education and/or career training. The VCCF Scholarship Program opens doors of educational opportunity for students of all ages. We firmly believe that by affording access to higher education to individuals, our entire community is strengthened. A scholarship is more than a financial award—it is the key that unlocks the future for these deserving students by building their confidence and removing obstacles that stand in the way of success. For more information on our different scholarships, please check the scholarship eligibility guidelines. VCCF Fund holder, Sylvia Mack presents the Berenice Barnard Music Education Scholarship to Talia Aharon-Ezer in 2014. Creating a Scholarship Fund is easy when you partner with Ventura County Community Foundation. You establish and name your fund, determine the scholarship’s eligibility criteria, and contribute a minimum of $25,000 (over a 5 year period for an endowed fund). A scholarship fund is a generous and high impact way to honor the memory of a loved one or to celebrate a special event. VCCF’s annual Scholarship Awards Reception provides you the opportunity to present your award to the recipient of your scholarship and to meet other donors. *Interested in starting a scholarship fund or adding to your current fund? Please contact Jim Rivera, Chief Compliance Officer, at jrivera@vccf.org. VCCF was honored to receive 2,072 applications for the 2016 Scholarship Program – Taylor Barnes was one of them. 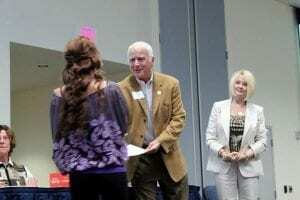 She received both the William and Cynthia Fairburn Memorial Scholarship and the Vivian Klemz Memorial Scholarship through VCCF. Now she is pursuing a BFA in Dance and a BA in Theatre with a minor in Psychology at Rockford University, Rockford, Illinois. That’s just the start though. Rockford University was one of eight universities invited to perform in Edinburgh Scotland at The Festival Fringe. Above is a picture of Taylor and fellow actors performing on The Royal Mile where you “hawk” your show to a potential audience. Taylor Barnes is in the middle. We also have a picture of Taylor dancing with Bad Wolf Dance in their Wilderness performance. The modern dance company is under the direction of Amy A. Wright. She is a dance apprentice with Bad Wolf. Applying for a VCCF Scholarship is just one page in your academic story, but by starting here the possibilities can grow beyond what you may have even dreamed. It has come to VCCF’s attention that some people are charging up to $1,000 to assist students with the application process. There is NEVER a fee to apply for one of our scholarships and we have generous people who will help students for free if needed.